For the film, see Glengarry Glen Ross (film). Glengarry Glen Ross is a play by David Mamet that won the Pulitzer Prize in 1984. The play shows parts of two days in the lives of four desperate Chicago real estate agents who are prepared to engage in any number of unethical, illegal acts—from lies and flattery to bribery, threats, intimidation and burglary—to sell undesirable real estate to unwitting prospective buyers. It is based on Mamet's experience having previously worked in a similar office. The world premiere was at the National Theatre in London on 21 September 1983, where Bill Bryden's production in the Cottesloe Theatre was acclaimed as a triumph of ensemble acting. The play opened on Broadway on 25 March 1984, at the John Golden Theatre, and closed on 17 February 1985 after 378 performances. The production was directed by Gregory Mosher, and starred Joe Mantegna, Mike Nussbaum, Robert Prosky, Lane Smith, James Tolkan, Jack Wallace and J. T. Walsh. It was nominated for four Tony awards including Best Play, Best Director, and two Best Featured Actor nominations for Robert Prosky and Joe Mantegna, who won the production's one Tony. Richard "Ricky" Roma: The most successful salesman in the office. Although Roma seems to think of himself as a latter-day cowboy and regards his ability to make a sale as a sign of his virility, he admits only to himself that it is all luck. He is ruthless, dishonest and immoral, but succeeds because he has a talent for figuring out a client's weaknesses and crafting a pitch that will exploit those weaknesses. He is a smooth talker and often speaks in grand, poetic soliloquies. John Williamson: The office manager. The salesmen need him because he hands out the sales leads but Williamson does not like how they treat him, especially Levene, who berates him for the unpromising leads Levene always seems to get. Baylen: A police detective. He appears in the final act to investigate the office break-in and interrogate each cast member behind closed doors. Mitch and Murray: The unsavory unseen characters are the owners of the real estate agency. They have a sales "contest", which puts enormous pressure on the salesmen to produce or to lose their jobs, in which only the top two will come out with prizes; the rest will be fired. There was controversy over lines in the play, and in the movie adaptation of it, in which it was claimed prejudice was shown against Indian-Americans. As a result, Mamet removed the language from a 2004 San Francisco revival. The controversial dialogue is included in the movie version about a potential lead from the Patels, an Indian family name. 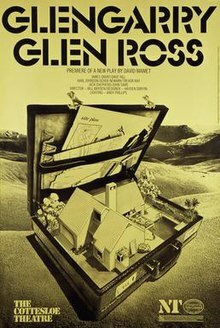 The world premiere of Glengarry Glen Ross was at the Cottesloe Theatre of the Royal National Theatre in London on 21 September 1983, directed by Bill Bryden. Glengarry Glen Ross had its U.S. premiere on 6 February 1984, at the Goodman Theatre of the Arts Institute of Chicago before moving to Broadway on 25 March 1984 at the John Golden Theatre and running for 378 shows. On 1 May 2005, a Broadway revival directed by Joe Mantello opened at the Bernard B. Jacobs Theatre. The revival starred Liev Schreiber as Roma, Alan Alda as Levene, Frederick Weller as Williamson, Gordon Clapp as Moss, Jeffrey Tambor as Aaronow, Tom Wopat as Lingk and Jordan Lage as Baylen. The revival received numerous Tony Award nominations, including Best Featured Actor nominations for Schreiber, Clapp and Alda, with Schreiber taking home the prize. The production also won the Tony Award for Best Revival of a Play. On 27 September 2007, the play was revived at the Apollo Theatre, London, starring Jonathan Pryce (who played client James Lingk in the 1992 film adaptation) as Levene, alongside Aidan Gillen (Roma), Paul Freeman (Aaronow), Matthew Marsh (Moss) and Peter McDonald (Williamson). The production was directed by James Macdonald. Glengarry Glen Ross has also been produced as a radio play for BBC Radio 3, featuring Hector Elizondo, Stacy Keach, Bruce Davison, and Alfred Molina as Roma, first airing 20 March 2005. A second Broadway revival, directed by Daniel Sullivan opened on 8 December 2012 at the Gerald Schoenfeld Theatre. The production starred Al Pacino (who had played Roma in the 1992 film) as Levene, Bobby Cannavale as Roma, David Harbour as Williamson, John C. McGinley as Moss, Jeremy Shamos as Lingk, Richard Schiff as Aaronow and Murphy Guyer as Baylen. This version received mixed reviews, with Pacino's portrayal of Levene being criticized. On 26 October 2017, a revival in London's West End directed by Sam Yates opened at the Playhouse Theatre, running for 14 weeks. The production starred Christian Slater as Roma, Robert Glenister as Moss, Kris Marshall as Blake, Stanley Townsend as Levene, Don Warrington as Aaronow, Oliver Ryan as Baylen and Daniel Ryan as Lingk. From February 2019 the production will tour the UK starring Mark Benton as Levene and Nigel Harman as Roma, with further casting to be announced. The 1992 film adaptation directed by James Foley was released using an expanded script featuring a role specifically written for Alec Baldwin. ^ a b Ferri, Josh (23 October 2012). "Expletives, Awards and Star Power: Why Glengarry Glen Ross Sells as a Modern American Classic". Broadway Buzz. Retrieved 24 May 2013. ^ a b "Glengarry Glen Ross (1992)". Internet Movie Database. Retrieved 5 August 2008. ^ Craig, P. (27 February 2004). "Mamet play to premiere in S.F." Contra Costa Times. Archived from the original on 26 July 2004. Retrieved 5 August 2008. ^ Chidanand Rajghatta (20 September 2015). "Patels in US divided over protest against PM Modi". Retrieved 21 April 2016. ^ Brantley, Ben (8 December 2012). "Fugue for Wrung-Out Tinhorns: Glengarry Glen Ross,' by David Mamet, With Al Pacino". New York Times. Retrieved 13 June 2016. ^ "Christian Slater and Kris Marshall to star in Glengarry Glen Ross in the West End". Retrieved 16 June 2018. ^ "Nigel Harman to star in Glengarry Glen Ross UK tour". Retrieved 16 June 2018. ^ Brietzke, Zander (28 June 2007). American Drama in the Age of Film. University of Alabama Press. p. 14. ISBN 978-0-8173-1571-9. ^ "Arena Theatre revival". Arena Theatre. Retrieved 3 November 2015.